I’ve led project meetings and presented in front of company executives, which is something I never thought I would be able to do before starting here. 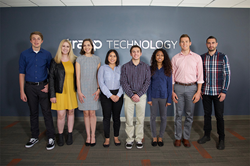 Trapp Technology, trapptechnology.com, a Phoenix-based provider of cloud, IT, voice, and security solutions, is pleased to announce its rapid growth of the summer internship program. Now in its second year, the program provides an opportunity for interns to gain experience by working alongside our skilled team of IT experts while having the opportunity to earn college credit for their degrees.